The Supersprint stainless steel center section for the E30 M3 is mandrel bent and replaces the cats that are standard in the same position. 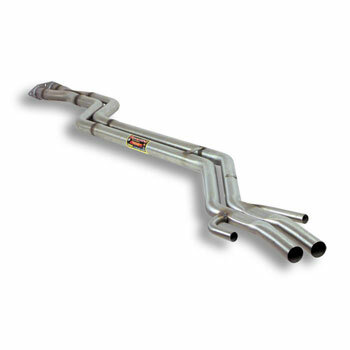 The popular choice for the E30 M3 for years when it comes to maximum performance with a lower volume. -Eliminates Cats but equipped with resonators for a quieter alternative to a straight center section. Also available in non-resonated stainless. -This is an oversized item as it must ship as one continuous piece. If your quoted price by web-site shipping is to high, we can try and assist during or after your order.